June 1143.The Lord Bishop of Winchester’s Clerk is bludgeoned to death in Pershore Abbey, and laid before the altar in the attitude of a penitent. Everyone who had contact with him had reason to dislike him, but who had reason to kill him? 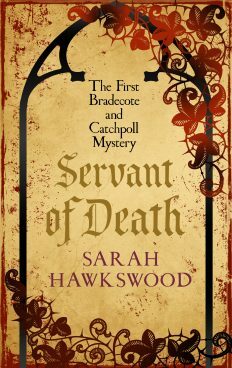 The Sheriff of Worcestershire’s thief taker, the wily Serjeant Catchpoll, and his new and unwanted superior, Acting Under Sheriff Hugh Bradecote, have to find the answer when nobody wants the murderer apprehended – until the next death. The first in a new series of twelfth century murder mysteries set in Worcestershire during The Anarchy. First published as The Lord Bishop’s Clerk.